I’ve recently given a lot of thought about “fireworks” or as I like to call it, “the wow factor” in dating. How important is it? What if it’s not there? Does it have to be there? I asked around what people thought and the majority of people thought that yes, it is important and that they would not want to continue with someone if there is no spark. I have to admit, I used to always think that if you had a good connection with someone and had everything else that the spark will come on its own. Isn’t it more important to have someone you can exist peacefully with? I wrote about someone (Mr. O) a while back who I had it all with but he didn’t want to be together because, as he put it, “everything was perfect, he couldn’t ask for better … except … but … he just didn’t feel that fireworks spark. He basically wanted a girl who made him feel like he was high and flying.” So there you go. I was so upset, annoyed, offended and angry at him. How could he say that?! Well, you know what? I now get it. After going on countless dates with countless men and attempting some relationships along the way, I totally get where he’s coming from. You NEED that “wow factor”. It is very important. I have met guys who totally have everything on my “list” and I could see myself having a peaceful happy existence with them, but, no “wow”. I have really struggled with it … wondering if I am giving up a good thing because where else will I find everything I’m looking for. So what if there’s no fireworks? But then I remember my marriage. There was good stuff there, but no spark. It didn’t evolve over time. So what about those who say that a fire that burns fast and hot will extinguish just as quickly? Well, I say that’s true. I agree. But, what if it doesn’t? If it extinguishes, then that’s all it was and you move on. But the fire that burns hot and stays hot is because you BOTH want it that way and you keep it going TOGETHER. Passion is so important in a relationship, whether it’s at the beginning or throughout. Passion is what helps you get through the rough times. Of course, you need friendship, trust, support and things in common, but passion is the glue. That “wow factor” is the passion … the glue. I’M NOT SETTLING for anything less than a BIG FAT WOW FIREWORKS DISPLAY! Neither should you!!! What are your thoughts on the “wow factor” in dating? Yep. It’s important. And it’s amazing when it happens. But it can’t last, and it’s the MOTHER OF ALL BUMMERS when the fire dies out. The question is, is there enough in the embers? I think if you keep feeding the fire it will stay burning … I’ve had years of passion with someone that doesn’t seem to have fizzled at all. It’s all about both people working to keep the fires burning. Once someone gives up it’s over. I often wondered about this ‘spark’ ‘fireworks’ business, can be really hard when one person feels it and the other does not. When we look back at history i.e. our parents and grandparents I wonder did they all feel the spark? If we look at other cultures also sometimes they arrange marriages (i dont agree with them) but do they have this spark? I wonder if the spark is something we now search for and won’t accept a relationship without it. To be honest I am a bit of a dreamer and find myself at 35 single, is life/love like a fairytale? am I holding out for something that in reality does not exist accept in films/books etc. Does a perfect relationship exist Suzie? Can you obtain the full package or do we (those that are single) perhaps have to change our perception of what is a relationship worth throwing ourselves into. Maybe just maybe we could have passed up on a relationship that if we would have given it a proper go, in time sparks could have been flying all over the place. Thank you so much. I am really glad you enjoyed the post and this post! Your insights are great. Honestly, I want the spark … seems like that’s what you’re holding out for too. We all deserve the best … whatever that may be! Thanks for the comment! 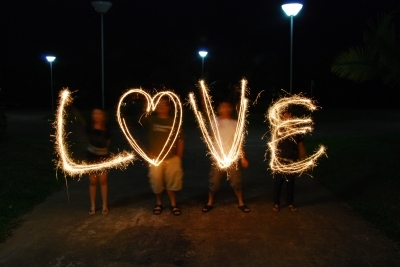 Keeping the spark alive is totally up to both people in the relationship … I agree! So awesome that you have that! Thanks so much for your comment! You’re oh so right about that … You NEED the heat to get through those rough times. What if someone’s personality doesn’t lend itself to “sparks”? Or is that just nonsense? I hear you. I went out with this guy a few years ago…gorgeous, funny, well versed in fine food and drink, and down-to-Earth as well. Totally the type I should be with…on paper. He was complimentary but not sleazy or overbearing and he made me laugh, I had a good enough time…but no spark, no attraction. I felt pleasantly about him (like a sunny afternoon or a smiling baby). He walked me to my car and I told him that I really liked him as a person, but that there was something missing. He smiled and said he felt the same, that he had a good time, but he wasn’t crazy with desire. It was a fun evening and an odd experience, but I can now say, without a shadow of a doubt, that r the “wow factor” is important to me. Thanks for your comment! Funny how someone we totally think will wow us doesn’t. It makes me, personally, reconsider what I want in a friend vs a mate.